Ulster's Andrew Trimble with Nans Ducuing of Bordeaux-Begles. WHAT HAS BEEN a very forgettable European campaign for Ulster finished in a very forgettable manner as they lost 26-22 to Bordeaux-Begles at the Kingspan Stadium. It was a poor performance for Ulster and they will be eager to get this two-week break before returning to Guinness PRO12 action after a terrible run of results. From the start Bordeaux went against the stereotypical French performance away from home and dominated the first 10 minutes, taking the lead through an Ian Madigan penalty in the second minute. While they may have controlled the early exchanges, Bordeaux’s first try was rather fortuitous as the ball popped out of a scrum and Dave Shanahan miscontrolled, allowing Yann Lesgourgues to pick up and finish. Up until this point the hosts had looked completely rudderless, making plenty of errors, but they did get a try of their own in the 18th minute when Shanahan spotted an overlap on the blindside and set over Andrew Trimble. But the visitors were still in the supremacy, especially in the forwards, and they eventually made that pack dominance pay as they drove an Ulster scrum back over their own line and number eight Marco Tauleigne pounced on it to score. Again Ulster struck back though, peeling off the back of a dominant maul and going through the phases on the line before Franco van der Merwe found the leg drive to power over. 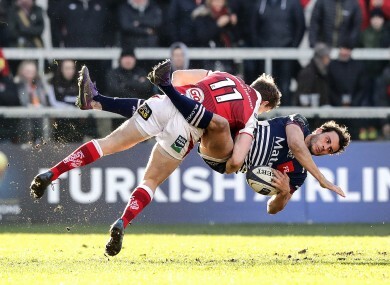 Madigan added another penalty for Bordeaux, which was cancelled out by Jackson on the stroke of half time by a Jackson effort which also saw Bordeaux full back Geoffrey Cros sin binned for a cynical offence on the 5 metre line. Apart from that penalty, however, Ulster could not take advantage of the extra man, driving repeatedly at the Bordeaux line but unable to make that key breakthrough for the try. Even worse was Jackson, who inexplicably pushed a penalty wide from right in front of the posts that kept the gap at five with Cros back from his spell on the sidelines. Nevertheless Ulster continued to batter away at the Bordeaux defence and eventually they cracked – centre Darren Cave coming onto the ball at pace and crashing in at the base of the post for the score. It was the first time Ulster had led in the game and it lifted their confidence slightly, but Bordeaux continued to defy the French stereotype and repeatedly held the Ulstermen at bay. And then when they attacked they were lethal, replacement fly half Simon Hickey converting two penalties late on to put them back in the lead, the second crucially taking the score outside penalty range. In the end that was enough, Ulster unable to force their way over in the dying seconds ending a dismal European campaign with yet another dismal defeat. (15-9) Charles Piutau, Tommy Bowe (Craig Gilroy 62), Darren Cave, Stuart McCloskey, Andrew Trimble, Paddy Jackson, Dave Shanahan (Paul Marshall 40); (1-8) Andrew Warwick (Callum Black 70), Rory Best, Jonny Simpson (Ricky Lutton 23), Robbie Diack (Kieran Treadwell 46), Franco van der Merwe (Clive Ross 54), Iain Henderson, Chris Henry, Sean Reidy. (15-9) Geoffrey Cros, Nans Ducuing, Jean-Baptiste Dubié, Joe Wakacegu (Julien Rey 70), Blair Connor, Ian Madigan (Simon Hickey 59), Yann Lesgourgues (Julien Audy 51); (1-8) Steven Kitshoff (Sébastien Taofifenua 35), Clément Maynadier (Benat Auzqui 61), Marc Clerc (Vadim Cobillas 54), Tom Palmer, Berend Botha (Joe Edwards 40), Louis-Benoit Madaule, Loann Goujon, Marco Tauleigne (Hugh Chalmers 68). Email “Ulster's poor European campaign ends with defeat to Ian Madigan's Bordeaux”. Feedback on “Ulster's poor European campaign ends with defeat to Ian Madigan's Bordeaux”.